Hello everyone. It�s good to back home in Boston. I�m pleased for the opportunity to continue communicating with you through my blog on an ongoing basis now that we are home. Before I share with you some of my week since I returned, I�d like to take a minute to respond to several questions that came to me from blog visitors. I would very much like to take a bit of time each week in my blog posts to answer some of your questions. So, please feel free to submit a question through the comment mechanism�I�ll try to answer several of them each week. Again, I am grateful for all of the well wishes, prayers and thoughts that so many people have left in their comments. I have enjoyed and appreciated your thoughtful comments and heartfelt messages. First, �QuaVadis� asked about the Cross above the main Altar, which was shown in the pictures from the Padre Pio Mass and celebration. 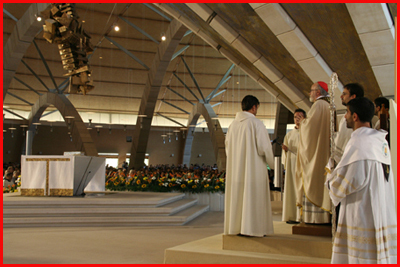 Having came upon your blog, I am delighted with the wonderful pictures that you have posted up with regards to your trip to the Shrine of Padre Pio and to Rome, however, a point of note, I find that the Cross above the Altar at the Padre Pio Shrine, a tad too modernistic for my taste, dnt you agree? Well, the large church that holds 10,000 pilgrims is a very modern, contemporary structure. The furnishings are also very contemporary. On the other side of the piazza, however, is the original Church, which is a typical traditional Italian Church with a Baroque-style altar. I think that they chose not to mix the styles. I�m not an authority on the architecture or furnishings of the new Church, but I understand that the same artist who did the Cross also did the chalices, the ciboria and the cover for The Book. They are all very beautiful. So one can see both the modern, contemporary elements as well as the traditional when visiting the Padre Pio Shrine. Sister, I can tell you�I have a fantastic program!�LOL! �In your opinion, what place has the best gelati in Rome? My husband and I recently spent our honeymoon in Rome and we liked Cafe Della Palma (near the Pantheon & Gesu) the most scrumptious. First �Kristy,� I wish you and your husband all the best and you are indeed both in my prayers. I cannot speak for Msgr. Deeley in regards to his favorite gelato. However, it�s my experience that it�s very difficult to find a bad meal in Rome�.or bad gelati. I would say the gelati around the Pantheon and the Piazza Navona is very tasty�but frightfully overpriced�lol! �Eddie,� in your Baptism, you were called to be part of a family, a community of faith, part of the Body of Christ. Wherever your journey may have taken you up to this point, know that the Lord is always calling you home to be part of that community of faith, part of that family; that is the Church. We live in a society that is highly individualistic where people are increasingly more alienated from others. But Christ came in order to call us to be part of something bigger than ourselves. I am very touched by the fact that the reflections on this blog have helped to rekindle in you an interest in that faith that you received in Baptism. I would certainly encourage you to come home. I�m sure that there are many wonderful Parishes and Priests in Philadelphia that could help you to reconnect with the Church. I�d be happy to share those names with you if you are interested. Well, it�s always a challenge to catch up after you�ve been away for even a short while. In the midst of this week, we had the wonderful celebration of St. Francis. St. Francis was such an incredible figure. His life has inspired millions of people to try to live the gospel more generously, more radically. Certainly his deep awareness of the Fatherhood of God and the fact that we are all God�s children, called to be universal brothers and sisters is a very important part of the message of St. Francis. St. Francis� �Peace Prayer� is a beautiful prayer that is basically about sacrificial love. We must be prepared to seek to be consolers rather than be consoled, to understand others, to give of ourselves…to love rather than be loved. It�s a sacrificial love that Jesus has taught us with his own example�.and the life of St. Francis was lived to such a wonderful degree. The other striking thing about St. Francis� life is that despite his great austerity and poverty, he was such a joyful person. That�s one reason that so many people followed him. As I always tell our young people, we reach maturity when we get to that point in life when we know the difference between having fun and being happy. St. Francis had a lot of fun when he was young, but he realized he really wasn�t happy until he began to follow Christ. We have the custom, the night before the October 4th Feast of St. Francis, to gather in a prayer service, which we call the Transitus. So I gathered with the Capuchins here in Jamaica Plain�and we have a community in Roxbury�.and so the two communities came together and we prayed the Psalms that St. Francis prayed when he was dying. We also read accounts from his biographer about his death and read the passage from St. John�s Gospel about the Last Supper and Jesus� farewell and great commandment of love. That was the Gospel that St. Francis asked to be read to him when he was dying. The next day, I had Mass at St. Cecilia on the Feast of St. Francis�it was actually the Closing Mass for the International Catholic Stewardship Conference, being hosted in Boston. The International Catholic Stewardship Conference brought many, many people from all across the United States and from all over the World to Boston. There were many Bishops, Priests, Religious, Deacons and lay leaders who came together to study about the spirituality of stewardship, which is not just a fundraising gimmick, but rather a way of involvement in the life of the Church by which we share our time, treasure and talent with others in life of discipleship. I know that members of our staff, led by our manager of parish stewardship Michael Rhodes, worked very hard to host this event and we are grateful for their efforts. It was a great joy for me, that, in part of the delegation from South America here for the conference, was one of my closest friends, Bishop Adalberto Martinez. He was sent here from Paraguay to be part of the conference. He stayed with us at the Cathedral for a few days. Bishop Adalberto was the first priest that I ordained in the Virgin Islands and now he�s the Bishop of a huge Diocese in South America. I also wanted to share with you a meeting that transpired yesterday here in Brighton. One of my functions as Archbishop is to bring together – on periodic occasions each year – the Bishops of the region to talk about issues of common interest. 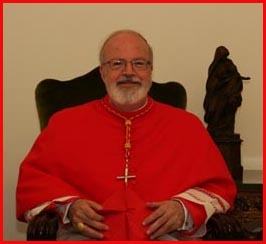 It�s part of the role of the Archbishop and yesterday I held one of those meetings. We discussed a number of topics including vocations and the Seminary. We also talked about our Priests who are serving the military and the need for Chaplains in the National Guard. 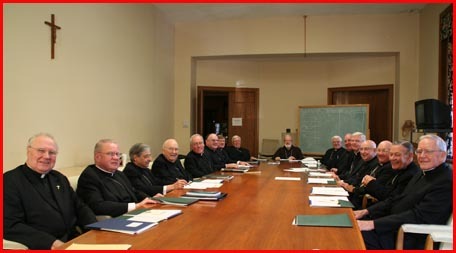 Bishops of the Boston Province Gathered Yesterday. Some of you may not be familiar with the use of the term �Province� in regards to Boston. An Archdiocese has satellite Dioceses with it, which all form a Province. Our Province is made up of Springfield, Fall River, Worcester, the Archdiocese of Boston, as well as the Dioceses that are Manchester (NH), Maine and Vermont. So six Dioceses and the Archdiocese form what we call the Province of Boston. I am what is known as the �Metropolitan� of the Province. Well, I hope you and your family have a wonderful weekend. The weather in Boston this week has been wonderful and I hope it continues that way for all of us to enjoy. Until my post next Friday�.